Nokia N90 is a multimedia mobile phone from Nokia N-indexed series smartphone line and is a redesigned 60th platform phone to be a new generation smartphones. Nokia N90 features 2 megapixel (1600 x 1200 pixels) camera with Carl Zeiss Optics, integrated flash and 20x autofocus, 256K colors TFT-LCD, MPEG-4 video-capture capabilities with on-phone editing capability, tri-band phone for GSM 900/1800/1900, EDGE and WCDMA networks, MP3 player, RS-MMC external memory slot, PictBridge compatible, Bluetooth and USB connectivity. SymbianOne (link dead) reviewed Nokia N90 multimedia cellphone and concluded that overall the N90 impressed. While it can not compete with a dedicated stills or video cameras for quality, it is certainly good enough to make the convenience of having a stills and video capability always with you far out weight any limitations. 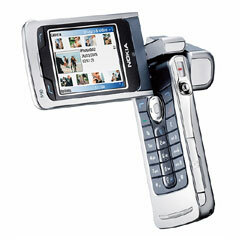 The folding design is both fun and functional and overall the N90 is a joy to use. Mobile-review commented that “in the end we have an interesting device with some perfect components and some disadvantages. That is for one to decide whether the pluses will outweigh the minuses mentioned or not. There are no complains of the mechanic part of the Nokia N90, everything is perfect. infoSync World gave Nokia N90 85% in camera phones score and 65% in business phones score ratings, with conclusion that as the first camera phone to apply proper optics along with a mix of a quality 2 Megapixel sensor, a brilliant high-resolution screen and a good selection of image management software, it’s no wonder Nokia’s N90 is best-in-class. Granted, it’s also an unwieldy beast, but this allows for a more flexible approach to snapping pictures and recording video due to its ability to shape-shift for shooting from the hip. Its external display isn’t of much use, however, and we certainly yearn for better synchronization to back up its decent amount of storage. CNet (link dead) editor rated Nokia N90 excellent rating of 8.3 out of 10, and concluded that it’s a startling combination of image capture, music playback, and communications capabilities in a clever but bulky Transformers-like package. However, at more than $900 for an unlocked model, the Nokia N90 is not for the faint of wallet. TrustedReviews meanwhile gave Nokia N90 rating of 8 out of 10 and concluded that it is pretty certain that you are going to be drawn to the N90 primarily for its imaging features, and will grow into the great screen and other software as time goes on. It’s just a pity that the handset is short on memory and doesn’t have an optical zoom component. CoolTechZone (link dead) reviewed Nokia N90 and concluded that overall, if you don’t mind the slow response, the bulky form factor, and are smitten by the idea of carrying a 2 megapixel camera phone, feel free to look into the Nokia N90, but if you are on a budget and want a possibly better product, the K750i may be another option to look at before making the final choice.